DALLAS — The Football Writers Association of America is very pleased to announce a new college football award this season named after Shaun Alexander, former University of Alabama and Seattle Seahawks star running back. 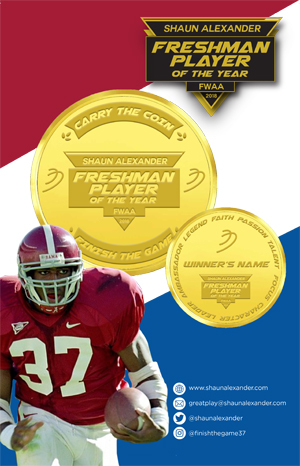 The Shaun Alexander Freshman Player of the Year Award will be presented to the top player on the FWAA’s Freshman All-America Team who possesses many of the same attributes that Alexander displayed during his illustrious college and professional careers. Among other things, the recipient will be presented with a gold coin emblematic of this prestigious award. The traits associated with the award are displayed on one side of the coin: “Ambassador, Legend, Faith, Passion, Talent, Focus, Character, Leader”. On the other side of the coin, the phrases “Carry the Coin” and “Finish the Game” are inscribed. Alexander, a three-time Pro Bowl running back with the Seattle Seahawks, played for the Alabama Crimson Tide from 1996-1999. He set a school record during his redshirt freshman season with 291 rushing yards and four touchdowns in the Tide’s 29-0 victory over LSU at Tiger Stadium. He finished his college career with 3,565 yards rushing (41 touchdowns), 798 receiving yards (eight touchdown receptions) and one kickoff return for a touchdown while at Alabama. Alexander then continued his outstanding success in the NFL, rushing for 9,453 yards and scoring 112 total touchdowns, fifteenth most in NFL history. In 2005, he led the league in rushing and was named the NFL Most Valuable Player. 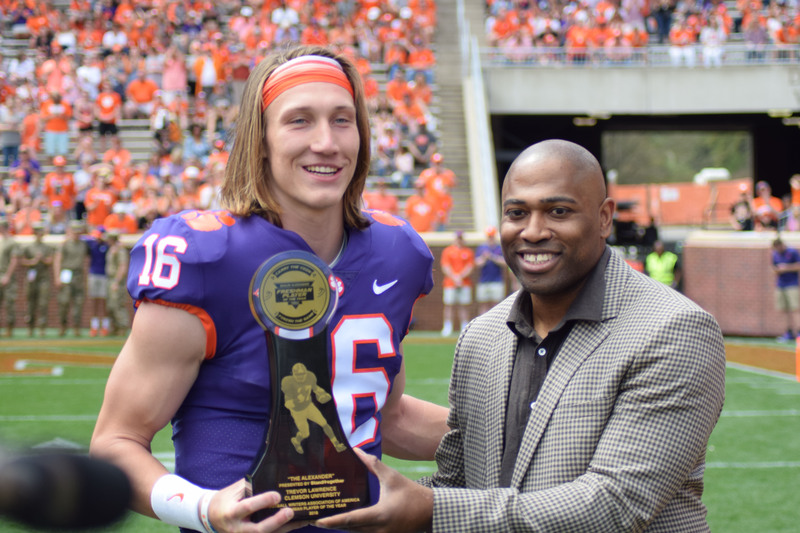 The recipient of the award will be revealed by Alexander at the FWAA’s Annual Awards Breakfast on Monday, Jan. 7 in San Jose, California in conjunction with the College Football Playoff (CFP) National Championship Game in nearby Santa Clara. The FWAA’s 18th annual Freshman All-America Team will also be announced at that time by FWAA Past President Mike Griffith, chairman of the team’s selection committee since its inception during the 2001 season. Griffith oversees a panel of writers on the selection committee who are geographically balanced across the country. They represent all 10 FBS conferences and major independents. True freshmen and redshirt freshmen are eligible for the team. 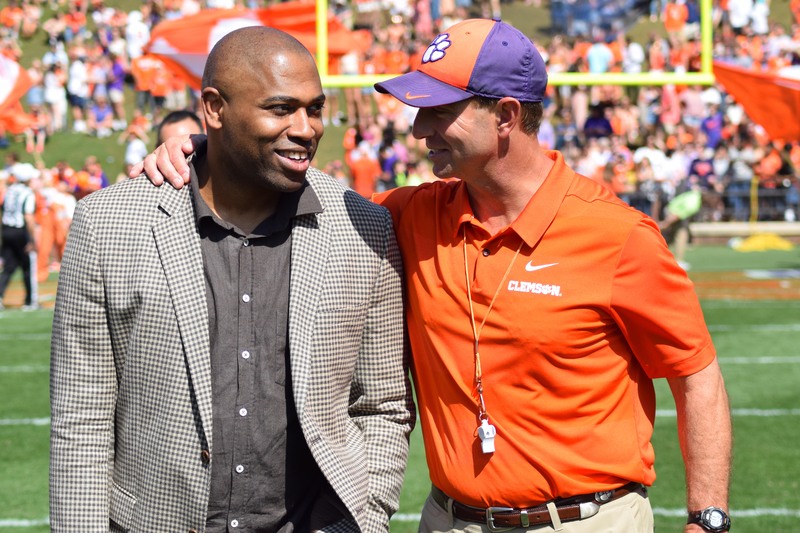 Shaun Alexander will be a member of the team’s selection committee. Founded in 1941, the non-profit Football Writers Association of America (FWAA) consists of more than 1,300 members, including journalists, broadcasters, publicists and key executives in all areas of college football. Led by current President Stefanie Loh of the Seattle Times, longtime Executive Director Steve Richardson, and a board of veteran journalists, the association continues to grow and work to help college football prosper at all levels. Visit footballwriters.com for more information about the FWAA and its award programs.